Over 100 Scouts have received Radio Merit Badges during the past year with the help of Alexandria Boy Scouts and Radio Merit Badge Counselors from Alexandria Radio Club (ARC). 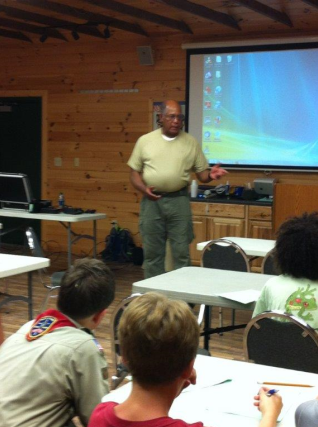 In late June, Scout Colin Baird, a member of Troop 4077, assisted ARC member Don Lewis, KI4D, with Radio Merit Badge sessions at Boy Scout Camp Powhatan resulting in over 40 Scouts earning Radio Merit Badges. Colin, who had already been awarded the Radio Merit Badge, told each class how exciting it was to earn his Radio Merit Badge while in a QSO with W5BII on the USS Orleck, a Museum Ship in Lake Charles, Louisiana, during Museum Ships Weekend. The USS Orleck was one of over 100 museum ships participating in amateur radio during Museum Ships Weekend, 2014. It just so happened that Colin’s QSO with the USS Orleck was conducted with a Boy Scout Radio Merit Badge Counselor who was very excited to be talking with Colin. His contact resulted in Sam Nelson, WA5VDM, sending Colin a beautiful certificate verifying his QSO. 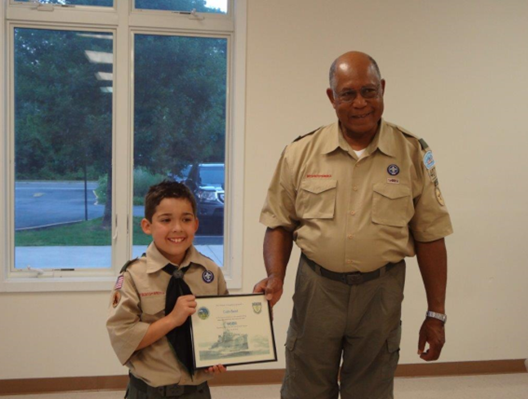 Sam spared no effort to rush Colin’s certificate, which was immediately presented at a Scout Court of Honor along with his Radio Merit Badge. 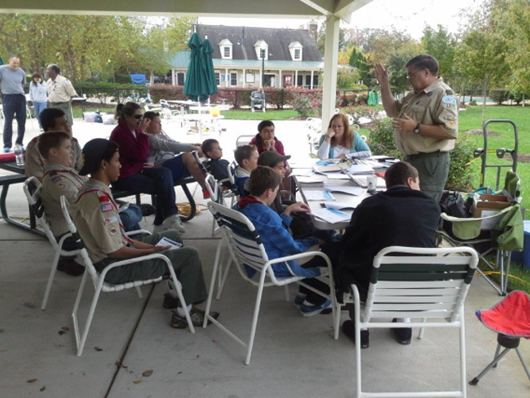 During the spring of 2014, Scout Nicholas Clevenger, Troop 993, assisted ARC Radio Merit Badge Counselors Don Lewis, KI4D, Steve Wagner, W8RJH, and Lee Ciereszko, N4TCW, with three separate Merit Badge Jamboree Day events resulting in over 60 Scouts earning Radio Merit Badges. Nicholas, also known as Nick, is also a General Class ham. 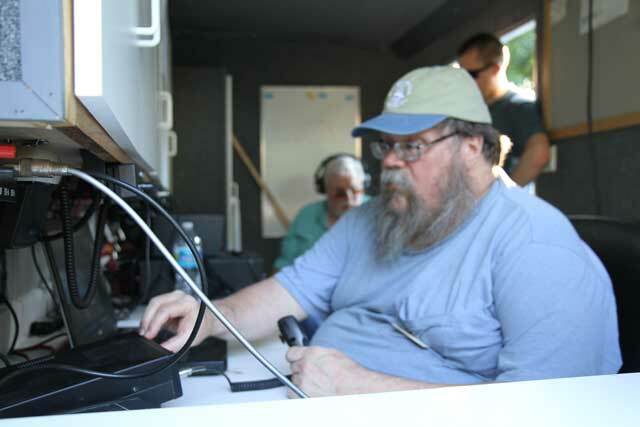 For each class, he demonstrated the power of SSB HF ham radio by contacting DX stations as far away as Russia and Spain using portable equipment in the classrooms. 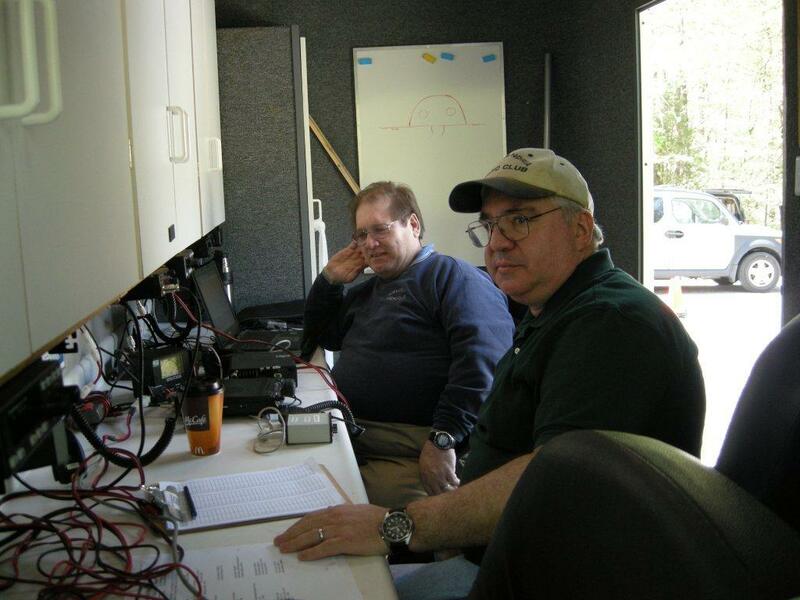 Last fall, Steve and Don combined forces at an annual Boy Scout Jamboree on the Air event while Steve conducted Radio Merit Badge sessions for approximately 15 Scouts. This is good news for ARC and the amateur radio community as a whole. 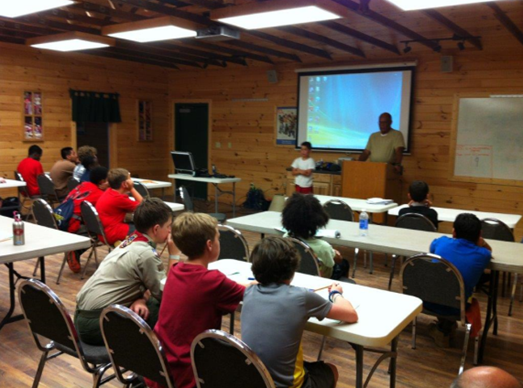 While Scouts are earning their Radio Merit Badges, they learn about 50% of what they need to know to earn a FCC Technicians License. Potentially this gives them a jump start into amateur radio, bringing much needed younger interest and energy to the amateur radio hobby. Field Day is JUNE 28th. We will start setup at 10AM and start operations at 2 PM. 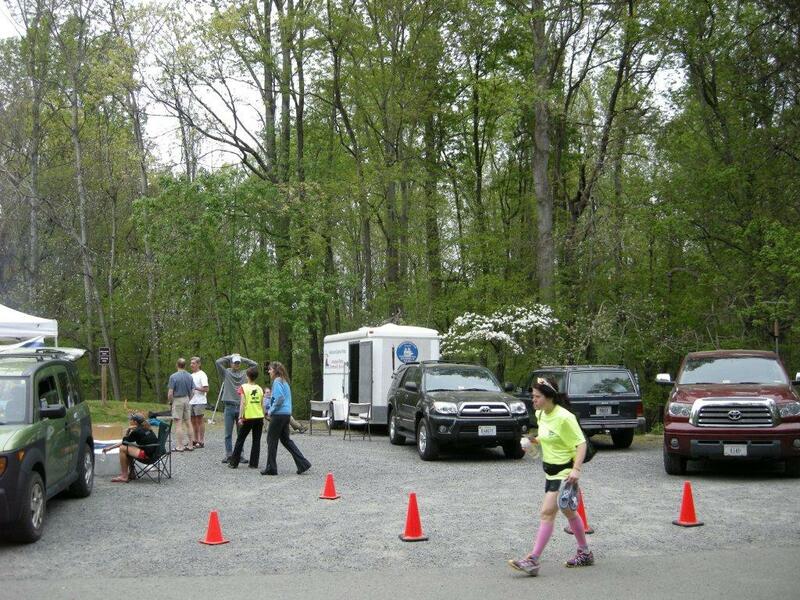 We will be 4A and use the club’s radios and Trailer. If you are going to be at Field Day for any length of time, I encourage you to tell Jack, K5OTZ that you plan to attend and make your $10 food donation at when you arrive. I have attached two maps one shows how to get to the site and one satellite image. If you come from Van Dorn then you will see the entrance on the RIGHT just after you go under the Metro overpass. If you come from the east it’s easy to miss the gate so slow down and the entrance across from the animal shelter just pass the water park. Please park in the parking lot. You may bring your gear up to the site, but we must be careful of the grass. We have the pavilion and the area between the ball fields. We may have to be careful of antenna placement if kids are playing ball. The goal is for everyone to get some operating time during the 24 hours. Our test is to see how well we can operate in field conditions. We will use the N3FJP software which is simpler then WIN-EQF. Jack will have a laptop set up to give a short class on the software. We should have sufficient power with the generators we have. There is power for laptops and lights, but no lights in the pavilion. Steve will be the food chair and he will need some help at meal times. 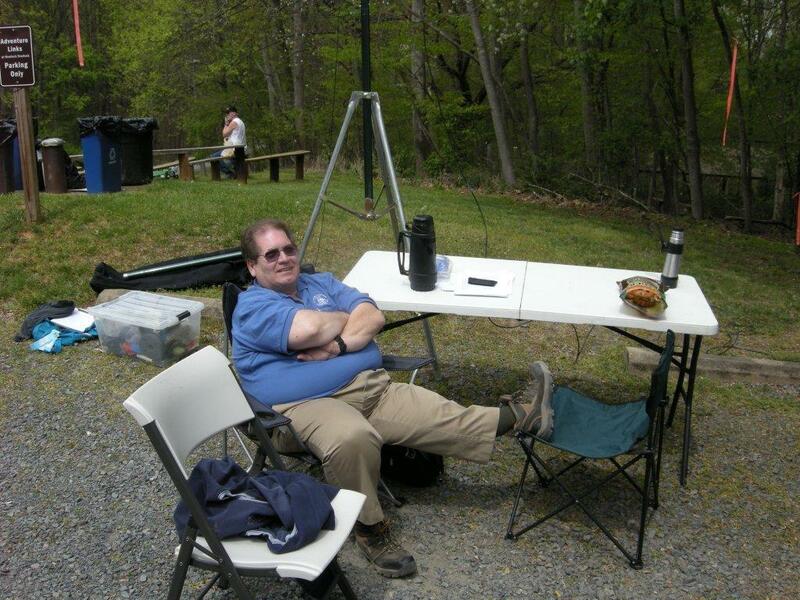 If you have a pickup, I could use a few folks to help take the coolers, water, antennas from my QTH to the site. If you can help, drop by my QTH about 9AM. The goal is to not have one person operate each station but for all to get some time on each band. If you plan to operate CW or digital modes you need to bring your key or digital interface. The radios we have are the Kenwood TS-450S that Tom KJ4FUU will oversee on 10/15 meters, Rich KA4GFY will oversee the 75 meter station using the Ten-Tec Jupiter, Harry, N4CWP has the Yeasu FT-920 on 20 meters and Ian will have 40 meters using his IC-706MkIIG ( The club’s IC-746 needs some work). A backup radio will be available. 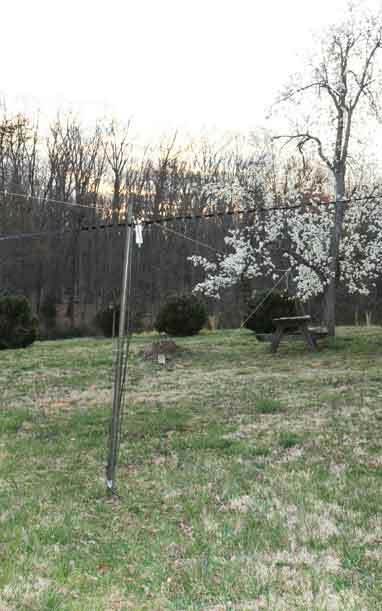 Antennas so far are a Cushcraft World Ranger 3 band dipole for 10/15, Harry will have his water pipe vertical and a rotatable dipole for 20, Rich will have an 1/8th wave vertical on 75 and Ian will have a 40 meter vertical. PLEASE come out and support this effort. In addition we expect to be asked to support a shelter drill with the City in the morning. Reception reports and/or message copy is very much appreciated. 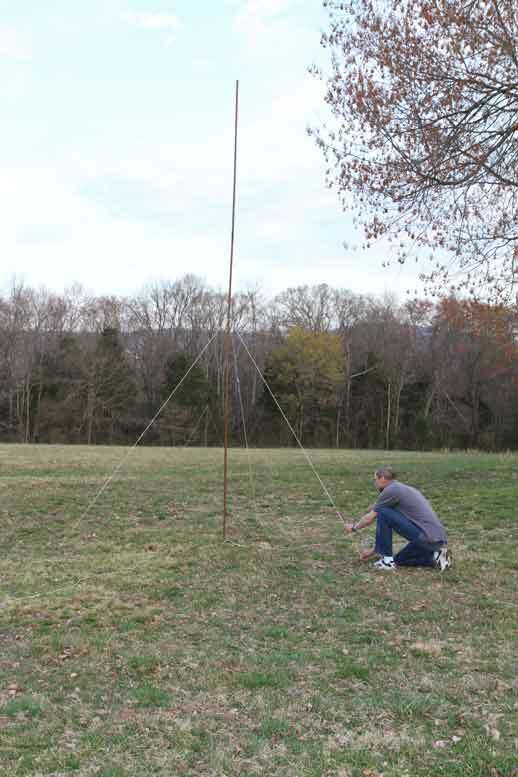 Elaborate equipment is not required, many Amateurs listening on the prospective 630M band are running simple antennas for reception, including 80M dipoles, HF verticals, et.al. Many current HF radios with general coverage receivers will also tune to the 472-479 kHz range. Best reception will be between sunset and sunrise (Saturday evening – Sunday morning). Please pass this information on to your Field Day group, local and/or regional nets, and fellow Amateurs. 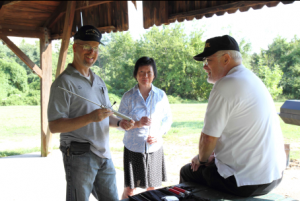 This operating event is being orchestrated to promote awareness of 630M operations, and is neither sanctioned nor in affiliation with the ARRL or Field Day directly. Many countries currently have secondary 630M Amateur allocations and the US should eventually follow suit. Reports can be sent to their respective station operators. Thank you and have a fun and safe Field Day. 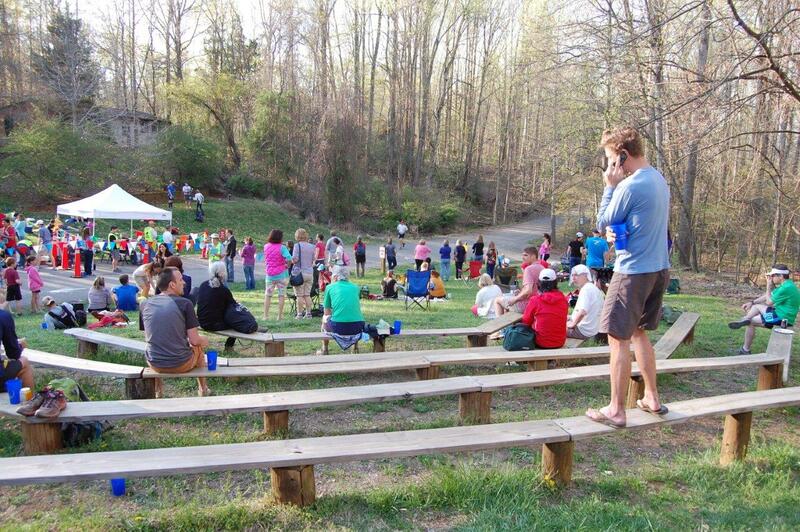 This year’s Field Day was a success with 42 people signing in which was a 30% increase over last year. 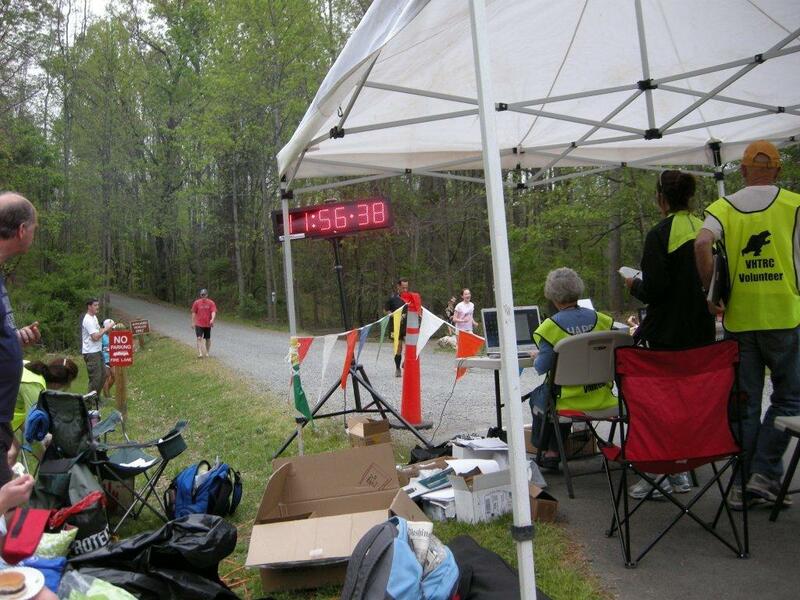 Saturday’s weather was fine; however, Mother Nature was not kind to us on Sunday with rain. This caused us to shut down early. Propagation and the noise level made getting started Saturday slow, but things improved. 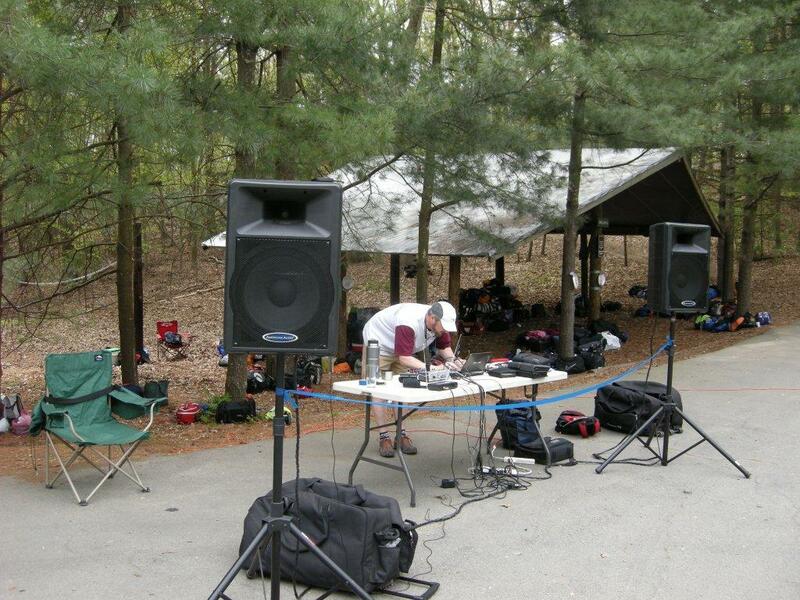 Several stations worked all night with 40 meters being our best station with over 200 contacts. 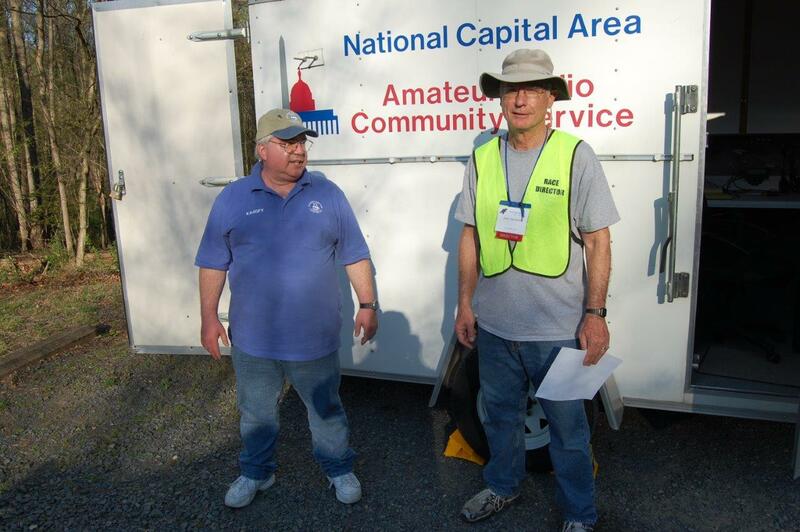 We had new hams getting on HF for the first time; many other club members worked our 5A field day status stations. 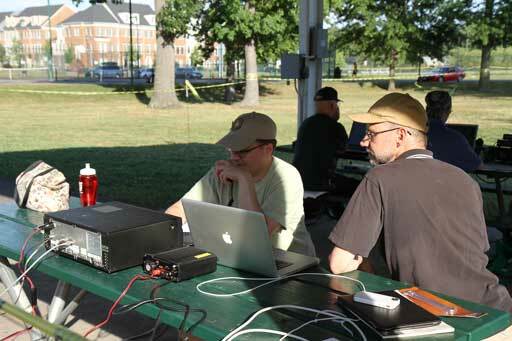 We had ups and downs with antennas, but they served us well, including Jeremy’s configuration-they worked as his station was the high scorer this year. The 40-meter station was operated entirely on solar power charging batteries. 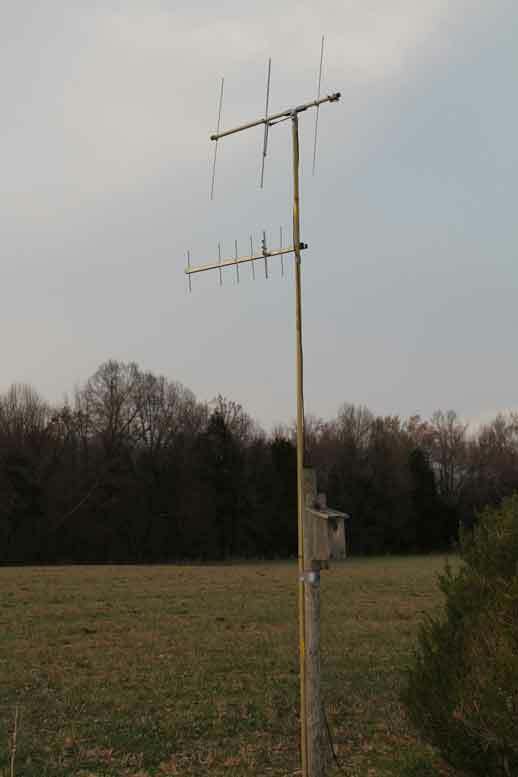 Also, this year’s field day’s station/antenna arrangement caused very little interference among radios. The band captains were KJ4FUU (TOM) who worked 10 meters, KA4FGY (Rich) and N4ASX (Rick) worked 75 meters, KV3W (Jay) worked 15 meters, N4CWP (Harry) worked 20 meters, KF7IJZ (Jeremy) handled 40 meters, and KI4D (Don) handled 6 meters. 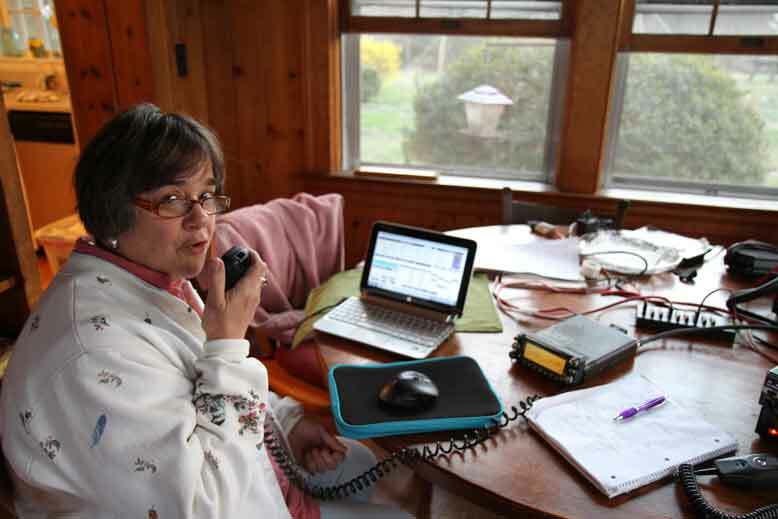 We got all kinds of bonus points, official visitors (Councilwoman Dell Pepper w/husband), press releases, down loaded an ARRL bulletin, message to ARRL section headquarters, kids operating radios, PR desk, and we (Rick) are working on our total score. And, we even have a video by Jeremy which will be up on our website. 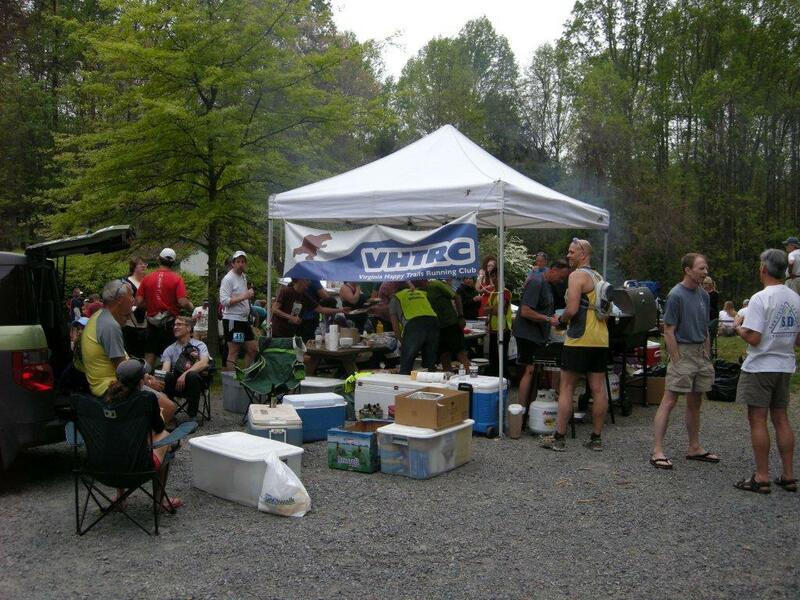 We had 42 people for Saturday’s evening meal…great barbeque. Ted (W9TCE) kept us supplied with refreshing lemonade. 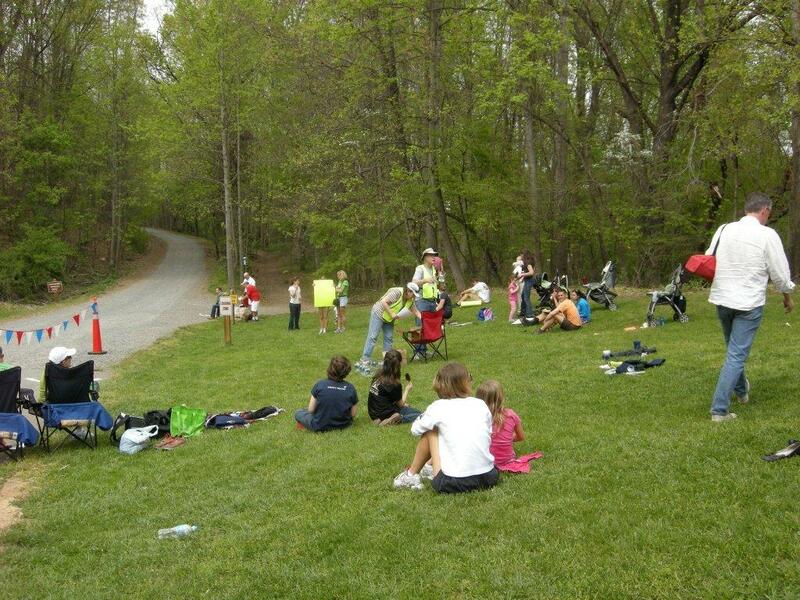 Field Day is one of our biggest activities which was demonstrated by the high turnout by the club. 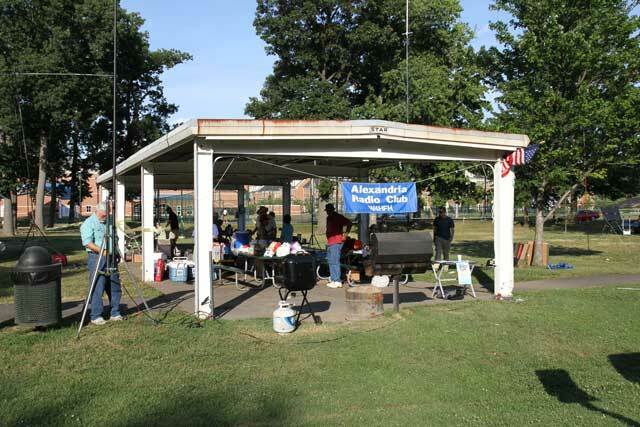 The Alexandria Radio Club had a great annual Field Day (FD) on June 23 and 24, 2012. Weather was perfect. However, propagation was not our friend. For example, Don (KI4D) did not hear a single 6 meter station. 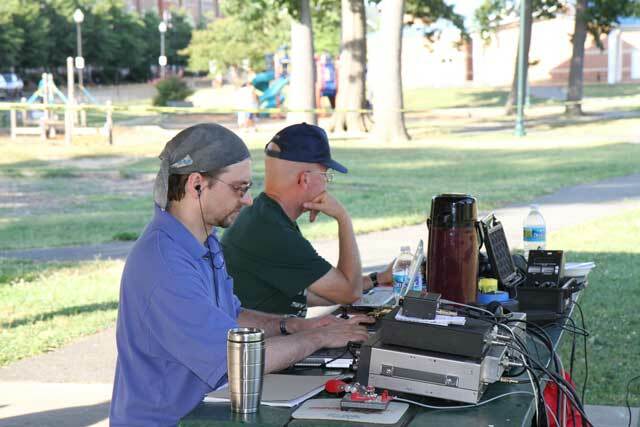 Overall, our FD contacts were down from last year, but we proved that the Club can set up eight working stations and operate them for 24 hours. This was made possible by Band Captains (K5OTZ, N4CWP, KA4GFY, KF7IJZ, KV3W, KI4D, N8IK, and KF4BBT) who set up their stations…lot of great work went into them. Thanks to Stephanie Adamy’s great effort, the FD food was super. Many thanks to her. And, we had a great time doing RADIO. 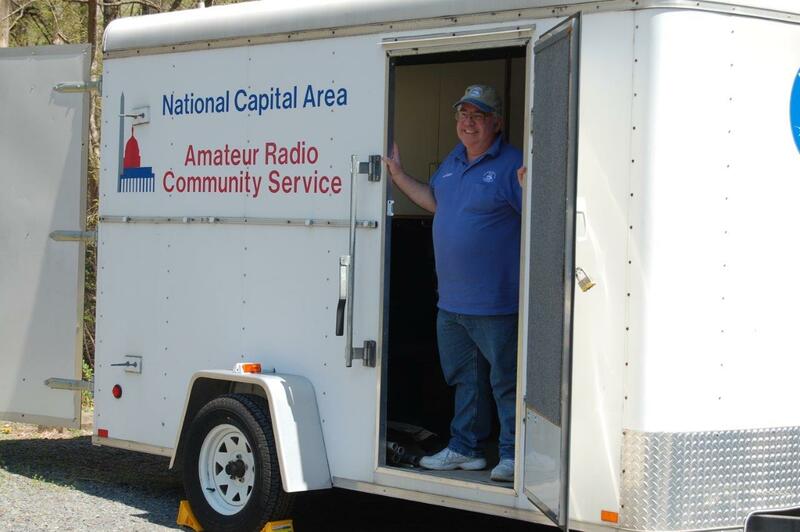 Thanks to Roy Wright (K4AXQ) our Webmaster for keeping FD information current on our webpage. 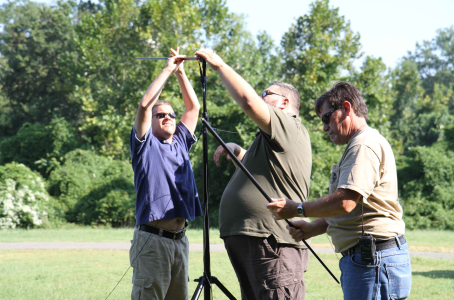 Major lesson-learned – we need to do a better job in our antenna set-ups and placements. Many THANKS to all that made this a great Field Day for 2012. 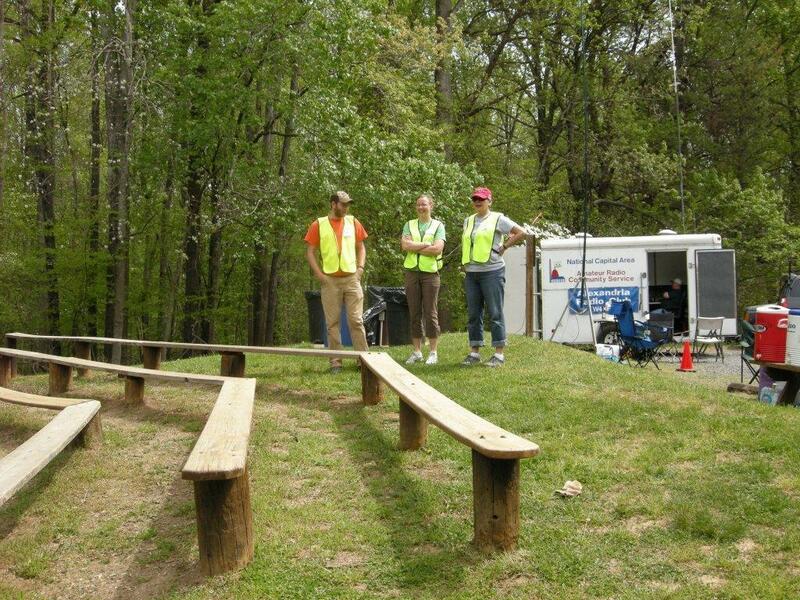 Club President Marshall DeBerry reported this ARC public service activity by participating club members at Hemlock Overlook in Bull Run, Virginia. 2 meters / 70 cm Yagi. 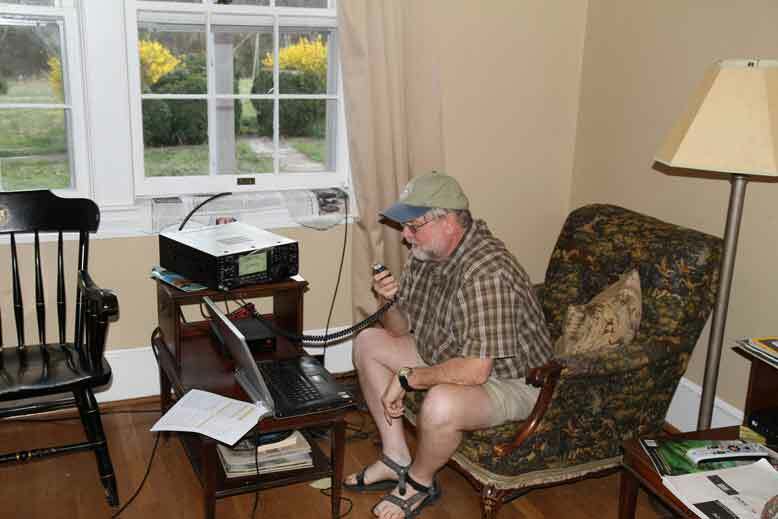 G5RV Home in Barboursville, VA in the county of Orange for the 2012 Virginia QSO Party. 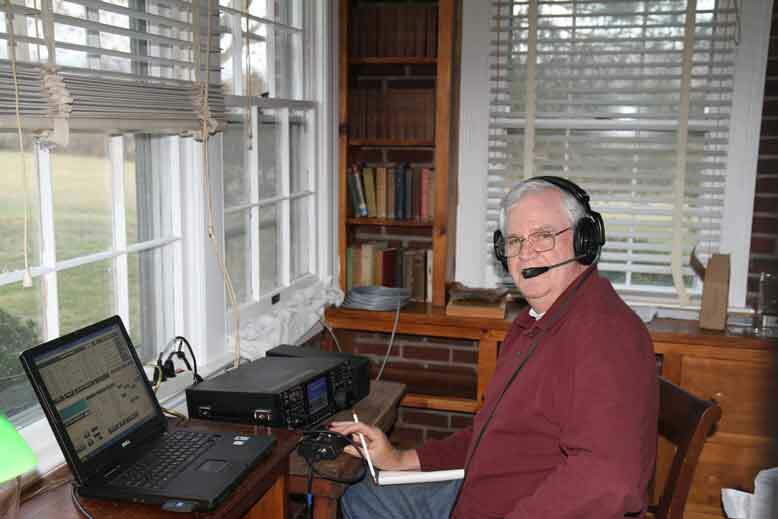 Marshall DeBerry - KI4MWP working 80m. 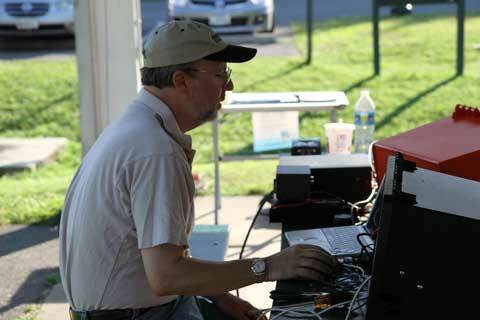 Randy LaPorte - KI4MWQ adjusting 20m. Randy LaPorte - KI4MWQ working 40m. Harry Jones - N4CWP working 20m. 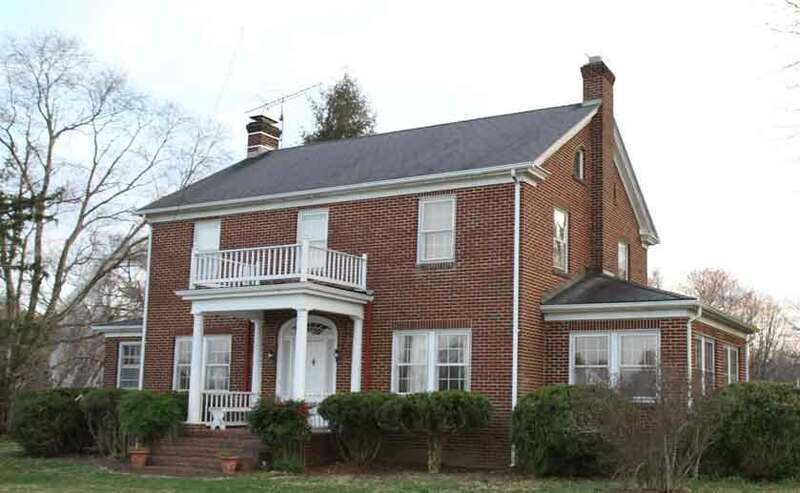 in a little expedition to Barboursville, Virginia in the county of Orange to build county scoring contacts for W4HFH club submission. President Marshall DeBerry reported the weather was great and the Virginia countryside was beautiful, with early spring making an appearance. Preliminary scoring indicates we scored better than our 2011 expedition to Buckingham county despite changes to the operating times and so-so propagation. 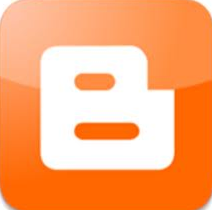 Click Here for a 2011 Pre-Planning Video of ARC approved site by City of Alexandria. This is the slide show and audio from a presentation I gave at the August 2012 Alexandria Radio Club meeting. 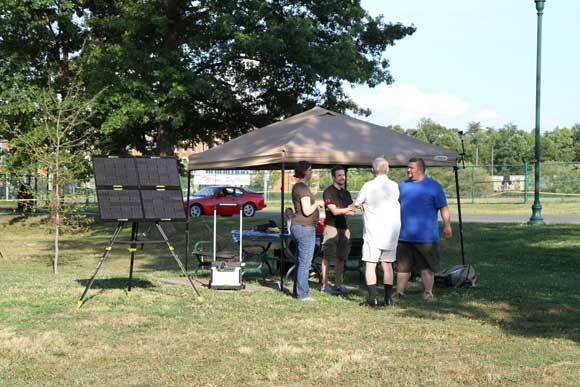 This presentation is based on information I have gathered by researching, experimenting with, and building portable solar powered generators of various types primarily for Ham Radio use. I am BY NO MEANS an expert! D-STAR advantage is ability to direct traffic to multiple operators, digital and packetized at the source, a 2400 bps audio input with 1200 bps of error correction and 1200 bps digital channel for GPS or other digital transmissions; uses spectrum more efficiently than FM signal. 1.2GHz system both digital voice and a separate 128KBps digital channel as a high power wireless router; hot spots, DV Dongles and some other developments. The Alinco DJ-G29T – 1.25 meter and 33 cm bands My major purchase at the Dayton Hamvention this year was the Alinco DJ-G29T handheld radio. 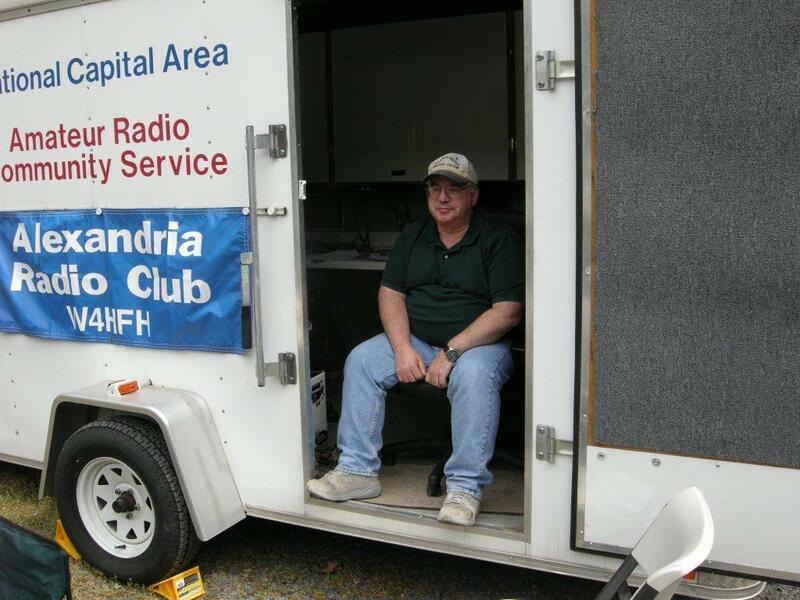 This particular model has some special significance for us in the Alexandria Radio Club because a couple of years ago at the Hamvention, Marshall, KI4MWP, put a bug in the ear of the some of the Alinco engineers to design and build a handheld radio that will work the 1.25 meter and 33 cm bands. Alinco was the only manufacturer marketing a handheld on 1.25 maters and the only way you could get on 33 cm was converting certain commercial equipment. At the 2012 Hamvention, Alinco had a mockup of what the new handheld would look like. 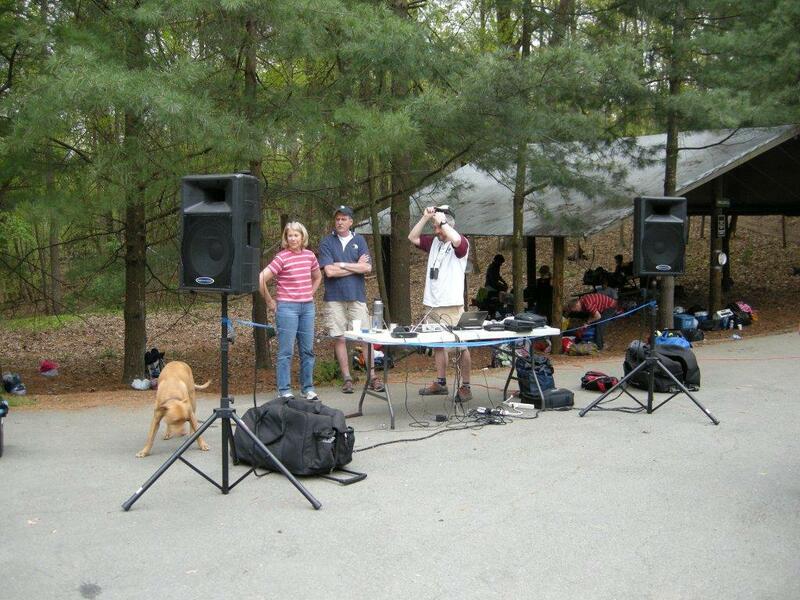 By the 2013 Hamvention, the DJ-G29T was a reality. Playing with it the hotel room Friday night, I realized the automatic offset needed to be turned off. A quick look at the manual and I figured out how to do it. A word of caution here, the manual was originally written in Japanese and translated into English, so some of the grammar and sentence structure requires some thinking to make sense of what it’s saying. The 1.25 meter of the radio worked well, while I managed to bring up a few 220 repeaters in Dayton with no trouble, even managing to turn on the correct CTCSS tones. When I switched to 900 MHZ, the radio reverted to auto duplex and I had to turn it off again. 927.500 MHz is the national simplex/calling frequency on 902 MHz, but the radio kept thinking it should have been a repeater. I managed to make a contact on 900 MHz simplex with somebody in a nearby hotel, so we both decided the radio must be working correctly. Having owned the radio for two plus months now, my first observations are that it’s a very nice radio. It has a nice feel to it. The power button took a bit of getting used to, but after awhile, it is not much different than any other radio. I found the first few times programming the memories, it was helpful to have the manual close by. With the manual guiding me, I was able to load frequencies into the memories with relative ease. One thing I found with the memories is if you put a name into the memory channel, that is what is displayed, not the frequency. Not a major problem. I would rather know the frequency than which repeater I’m on. I know which repeater I’m on by the frequency. So far, signal reports have been positive on both 1.25 meters and 33 cm. The receiver has plenty of audio and the transmitter sounds very clean. The transmitter is rated at 5/1/0.4 watts on 1.25 meters and 2.5/1/0.4 watts on 33 cm. That will work most anything in the local area. It comes standard with a 1.2 AHr battery pack, which I find is plenty for what I use the radio for. I will say for most of my VHF and UHF radios, I’m an ICOM guy. I can usually have an ICOM up and running in a few minutes. There was a learning curve here. This was my first venture into Alinco territory. I applaud Alinco for diving into this niche market. Perhaps this will encourage hams to try these two bands. With activity comes more options for equipment. While there are not a lot of 33 cm repeaters on the air, there are quite a few 1.25 meters repeaters. All it takes to generate activity on a new band is for a few hams to buy equipment for it and start using it. This is great news for hams because we now have a 33 cm radio that is VFO programmable and has the memory capacity we have become used to. (Us old timers remember crystal controlled VHF/UHF gear or only 10 memories). Having said all that, you may be wondering why I bought this particular radio. 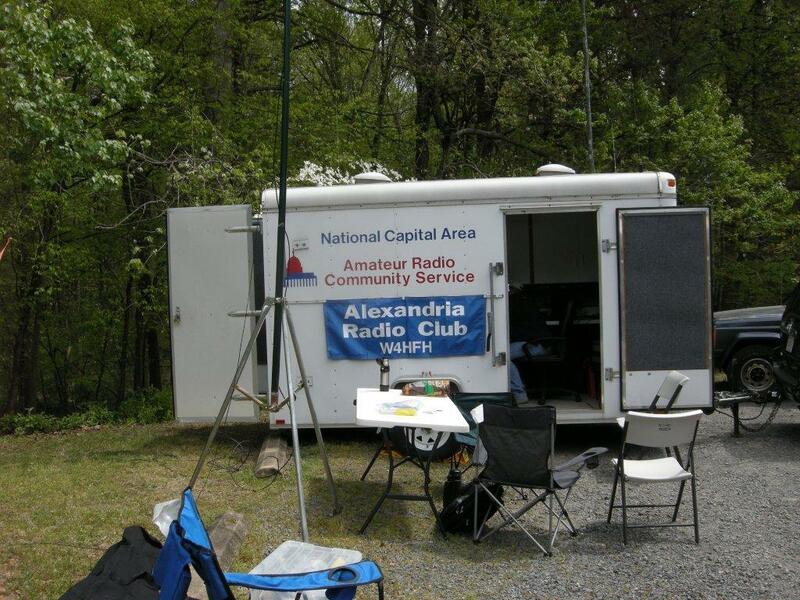 Well, the Alexandria Radio Club is the proud owner of repeaters on both 1.25 meters and 33 cm. Both repeaters are commercial grade and sound great. They just need more activity. 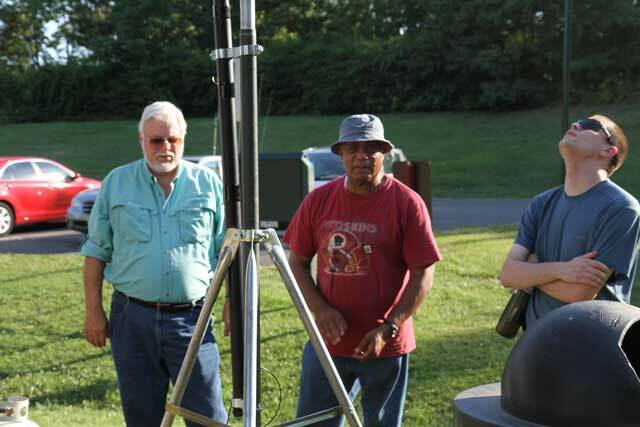 In fact, the August 2013 issue of QST had an article on the 33 cm band. Not only that, N4ASX still has a few of the Motorola GTX handhelds that need a forever home. 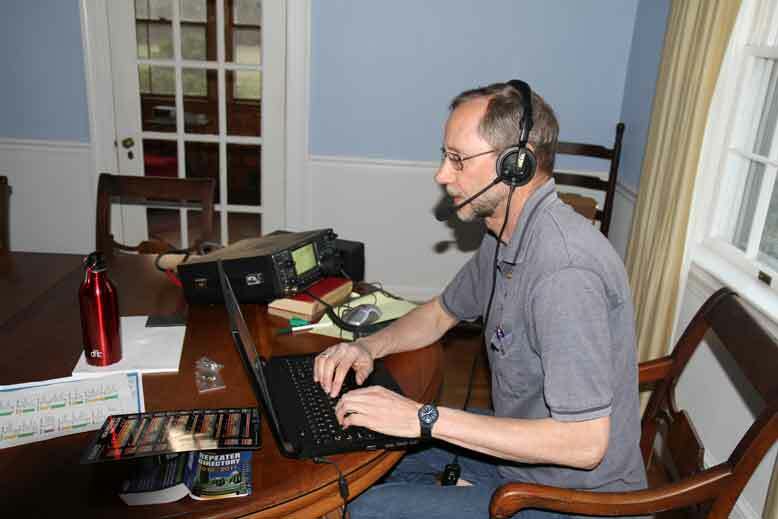 Jeremy – KF7IJZ, suggested that ARC sponsor an open event that would help get new hams comfortable with operating amateur equipment on the air. 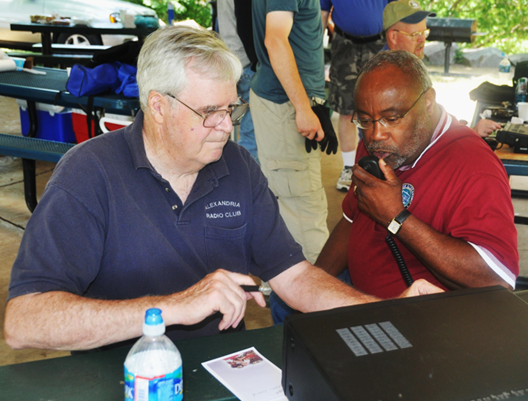 On a beautiful sunny day in Ben Brenman Park, eleven individuals turned out to explore what ham radio can offer. All had a great time, and many suggested that we continue to offer these types of “mini-field day” sessions throughout the year. Photos: Saunders Moon-KD4LEL, Rick Bunn-N4ASX, Marshall- KI4MWP, Ian Keith-N8IK and Yeeleng Rothman-KK4CKI. There were eleven people in attendance, Joe Dupesko-KJ4UYH, Cristina Dupesko-KJ4UYC, Jeremy -KF7IJZ, Bobby Richardson-KK4CKJ, Larry Walker-KK4CBL, Cameron Mackenzie-K6CLM. 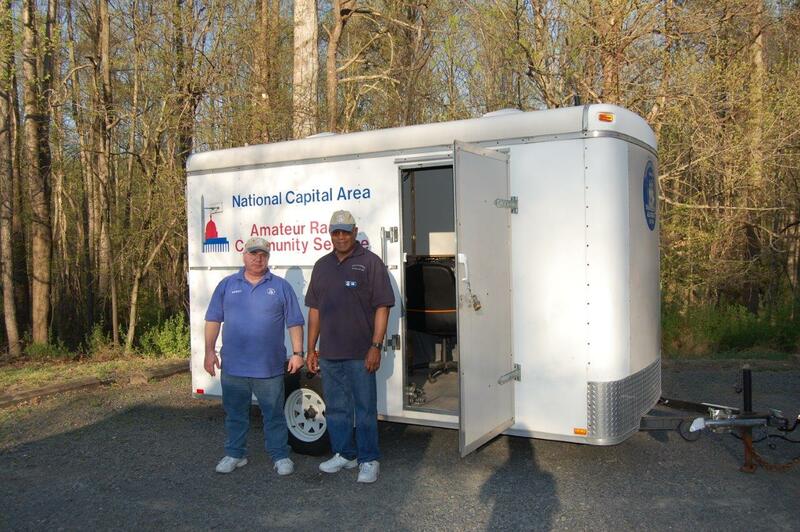 Alexandria Radio Club supporting the Bull Run 50 on April 13th showing the finish line, Net Control operators (KA4GFY andKI4D) the race director (Anstr Davidson) and the club trailer. 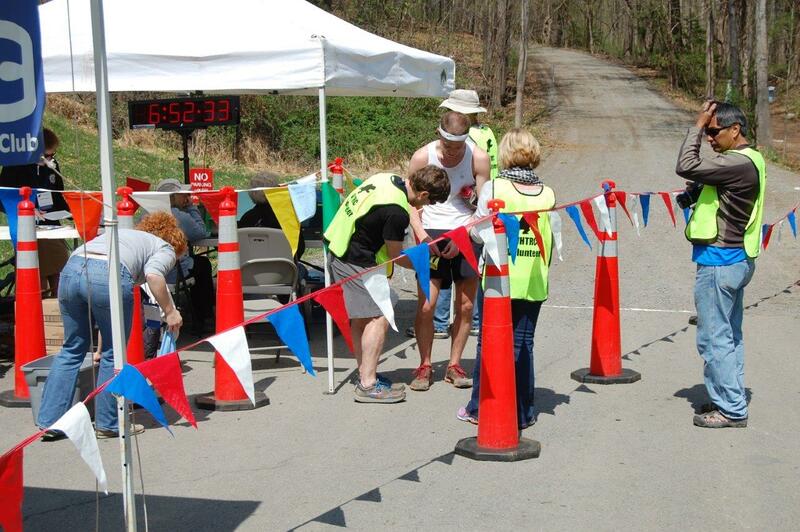 Others Club members participating were Jeremy Kolonay, KF7IJZ and Chris Sullivan, KJ4QEG.